Applied Materials, a U.S. firm that supplies equipment and software for manufacturing semiconductor chips, has halted services to several Chinese companies, less than a week after they were included on a “red-flagged” list by the U.S. Commerce Department. The notice also demanded that staff, contractors, and other personnel immediately withdraw from the sites of those flagged companies, according to Nikkei, warning that failure to comply could lead to violations of U.S. trade law. On April 10, the U.S. Commerce Department added 37 Chinese companies, universities, and research institutes to a red-flag list of “unverified” entities that U.S. companies should treat with caution. Being on the list doesn’t mean that the U.S. authorities have created a sales embargo, explained Kevin Wolf, former assistant secretary of commerce for export administration in an interview with Reuters. However, U.S. companies must apply for new licenses in order to sell products to, or repair goods for, companies on the list. Citing unidentified sources, Nikkei said that at least three Chinese entities flagged last week were also clients of Applied Materials: Xiamen San’an Optoelectronics, China’s biggest LED chipmaker; Xi’an Jiaotong University; and an unnamed unit of the state-run Chinese Academy of Sciences. Industry sources that Nikkei didn’t identify said that the U.S. chipmaker’s decision could influence other U.S. vendors, as well as companies outside of the United States that work with those Chinese entities. 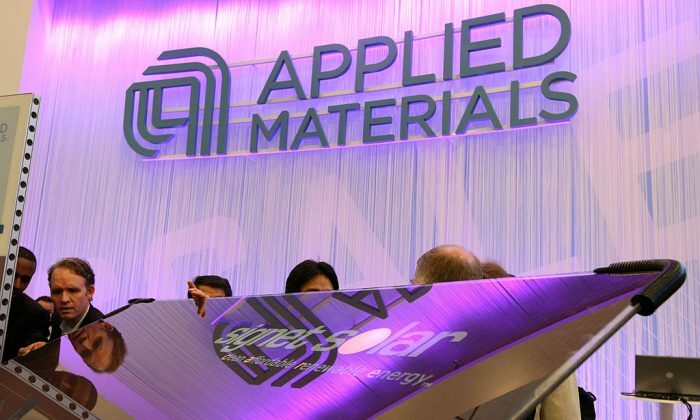 Applied Materials generated about 26 percent of its revenue in the quarter ending Jan. 27 from China, its biggest market, according to Nikkei. But the company supplies to all major semiconductor and LED panel makers in the world, including Intel, Taiwan Semiconductor Manufacturing Corp., and Samsung Electronics. Founded in 2000, San’an Optoelectronics went public on the Shanghai Stock Exchange in 2008. On its website, San’an says that it took part in China’s national 863 and 973 programs. The 863 Program, started by former Chinese Communist Party leader Deng Xiaoping in 1986, focuses key tech industries such as biotech and space “for efforts to clandestinely acquire U.S. technology and sensitive economic information,” according to a 2011 report from the U.S. Office of the National Counterintelligence Executive. Meanwhile, the 973 Program focuses on tech research for the Chinese regime’s interests. “Both programs have had the effect of making it easier for China to steal intellectual property in order to achieve program goals,” according to tech firm Recorded Future. In fact, IP theft targeting Applied Materials has occurred before: in November 2017, four former engineers at Applied Materials were indicted by U.S. prosecutors for stealing chip designs from the company and attempting to use them to set up a Chinese startup. Meanwhile, San’an has relied on government subsidies and recruitment programs to catapult itself to become China’s leading LED chipmaker. Multiple Chinese media reported that San’an received a total of 3.395 billion yuan (about $506 million) in government subsidies between 2009 and 2016. While it isn’t known how much the company has received since then, in 2017, San’an received funding from Beijing’s industrial policy of “Made in China 2025,” according to the firm’s 2017 annual report. Beijing rolled out Made in China 2025 in 2015 as a blueprint for turning China into a high-tech manufacturing powerhouse, in areas such as aerospace and robotics. San’an has also actively recruited tech talents from abroad, including more than 400 Taiwanese, who either hold senior management or key technology expert positions in the company, according to March 7 article published on the Xiamen municipal government’s website. San’an is based in the southern city of Xiamen in Fujian Province. San’an also recruited experts under China’s “Thousand Talent Program,” which was rolled out by Beijing in 2008 to aggressively recruit promising workers in the science and technology fields. According to a March 2012 report by Xiamen Daily, Liao Tingdi, the chief scientist in optical engineering at San’an, was recruited through the Thousand Talent Program. He has been working at San’an since December 2010, according to his personal LinkedIn page. Correction: A previous version of this article misstated the year when Liao Tingdi began working at San’an. Liao started working at San’an in 2010. The Epoch Times regrets the error.